Officer Jones was off-duty on the morning of August 26, 1994, when his fellow officer Officer Ron Ryan Jr. responded to what appeared to be a routine "slumper" call. A complaint had been received about a man sleeping in a car in a church parking lot on the east side of St. Paul, Minnesota. Officer Ryan approached the vehicle and woke the sleeper, who then identified himself. As Officer Ryan was returning to his patrol car to check the suspect's identification, the suspect shot him from behind with a gun he had hidden underneath his coat. The suspect, who had a warrant for his arrest, then took Officer Ryan's service weapon and shot him several more times. Officer Ryan was rushed to a hospital but died of his wounds. The suspect fled the scene, triggering a massive manhunt as he was pursued by St. Paul police officers with their highly trained K-9 dogs. 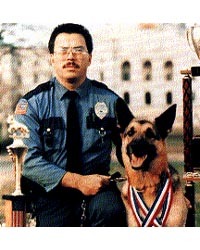 Among them was Officer Jones, who had volunteered to help search for Baker with his K-9 partner. The suspect was hiding in an ice fishing shack when the K-9, Laser, picked up his scent. When Officer Jones and Laser approached the shack, the suspect shot and killed Officer Jones. The suspect left the fish house and as he stood over Officer Jones, he was attacked by Laser. He shot Laser four times and then took Officer Jones' service weapon, hid the Officers' service weapons under the porch of a house, and hid underneath a pile of lumber and rubbish next to a porch two houses away, where he was apprehended. Rest in peace Officer Jones.